Happy New Year! Many of us wrote down plans, resolutions, goals, etc. 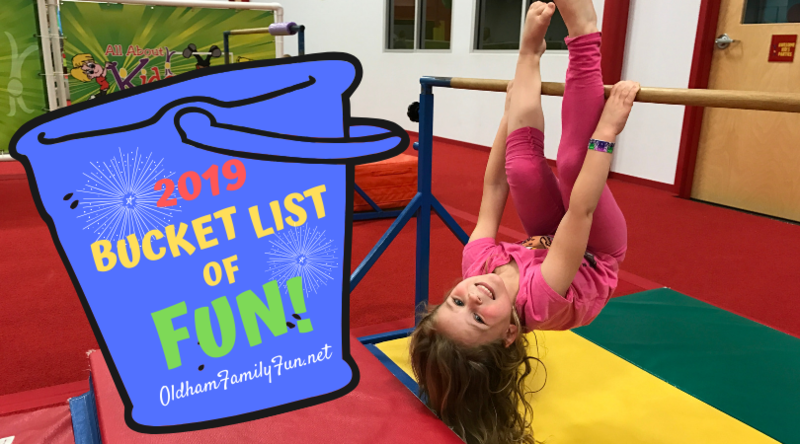 for 2019, but why not plan a bucket list of fun things to do this year? Our bucket list has at least two local options for each month that won't cost you an arm and a leg. Many of these activities are FREE or under $10! We like cheap family fun! What's on your bucket list this year? January - It's cold, you ran everywhere in December and you'd rather not spend a whole lot of money. Now is the perfect time to check out the Creasey Mahan Nature Center. The center is FREE! Check their website for hours. The center has fun nature art crafts for children, dioramas to explore, a bird blind to watch birds and a fun play area for kids to enjoy. If it's not too cold outside, families can also enjoy a hike or play on the playgrounds located on the preserve. It's a great place to fly a kite on a windy January day too! If you're looking for more indoor fun, All About Kids in Crestwood has open gym and swim times for all ages. Play on the gymnastics floor, play basketball, soccer or swim in their fun indoor pool. If your kids have been wanting to try something new, they can also try out their first class for free! February - Have you been to the new Oldham County History Center in LaGrange? The newly renovated building has exhibits to explore and fun activities through their History Hounds program. History Hounds is for children 5 and under and meets on Thursdays. The program is free to History Center members and $5 for non-members. The history center has several other programs for children and adults. Cailin Art Studio in Crestwood is also a great indoor option for families. They offer Art Together: Preschool Class for $15 per 75 minute class. Several other art classes and events are offered throughout the year at the studio. A great event to check out this month is the Chocolate Crawl in downtown LaGrange. Early bird tickets are only $10! March - Take your kids to see a show at the Oldham County Schools Arts Center! These family-friendly shows are entertaining and you'll probably recognize some familiar faces and names on stage! Many of the actors are local Oldham County children. What a great way to introduce your children to theater and support local art! Show admission is generally $10 for adults and $8 for children. Sometimes you can find a steal and see two shows for $7! Did you know there is a local community center that offers free activities for Oldham County residents? The LaGrange Community Center has programs for children and adults ranging from Kid's Night Out, pickleball, fitness classes, fencing and more. April - You know there are horses in Oldham County, but what about all of the other lovely animal encounters to be had? Take a farm tour where you might run into some bison, alpaca, sheep or a racehorse! We love the Harvest Moon Dairy Farm where groups can learn about a working dairy farm and have a chance to feed a baby calf. Other favorites are the Bluebonnets & Bluegrass Alpaca Farm Tour in Crestwood and Woodland Farm in Goshen. Want some adult time? Tour a working distillery or brewery in the county. May - Ahhh...finally warmer weather! Many outdoor concerts and movies start this month. Find a FREE concert, movie or have your own outdoor family movie night at home. FoxHollow Farm's Sunset Concert Series offers wide open spaces, hay bales to jump on and a variety of food trucks for concert goers to enjoy. Admission is $10 (in advance) and FREE for children 12 and under. We're hoping the Sauerbeck Family Drive-In will be back up and running by this time. If so, support this local family by watching a double feature at their drive-in movie theater. June - Downtown LaGrange is beginning to get busy again. Arts on the Green is a neat festival on the town square showcasing artists' work. Read our review here. The LaGrange Railroad Museum is usually open to visitors during the Arts on the Green Festival also. Check out the museum and learn more about what they have to offer for families. Admission is free to the museum and they are open on Saturdays. Families should also take advantage of the wonderful summer reading programs that the Oldham County Public Library starts around this time of year. The programs are free, entertaining and educational. July - One of the more popular events in Oldham County has to be Oldham County Day! The special event is always the 3rd Saturday in July. Families can enjoy a pancake breakfast, fun parade and entertainment on the Courthouse Square in Downtown LaGrange. This event is a great way to show your pride in the county. Read our review here. Family Fun Day at Creasey Mahan Nature Preserve is always a favorite with the kids. July in Kentucky is hot and a good hose down from the North Oldham Fire Department is perfect! Raptors are inside and the inflatables and other fun are outside. Another fun family activity in July is the Oldham County Family YMCA Mud Run. They do a great job with the course and the price isn't too bad for this unique activity. August - Love a good county fair? If so, the Oldham County Fair is for you! Admission is $12 and it includes unlimited rides on the fairway. Families can watch FREE magic shows, pageants or spend a couple extra bucks on camels rides or at the petting zoo. Read why we love the fair here. Creasey Mahan's Woofstock is great FREE fun in August. Bring your family dog along for a nice walk on the preserve and pet-friendly activities. Families can learn about and interact with butterflies also. Hidden Hollow Orchard is our closest apple orchard and usually has an opening date in mid-August. Take the kids on a unique outing and go apple picking together. September - Check out the LaGrange Farmers' Market and Artisans on the square in Downtown LaGrange! Local produce, sweet treats, meat, coffee and more goods are to be found! Take a walk down Main Street to visit more local shops and eateries. Explore one of Oldham County Parks this month. September can bring mild mornings and evenings to take a great hike, play at a park or ride bikes. October - Oldham County has no shortage of Fall Festivals and Halloween events. If you're looking for treats, Boo Dell at Yew Dell Botanical Gardens is the place to check out. Trick-or-treat your way through the beautiful gardens, meet local fire heroes and see a magic show. Admission in 2018 was $5/person. Another great place to find treats and a not so scary haunted house is at the Haunted Hike at Creasey Mahan Nature Preserve. Admission is $6/person and includes treats along the forest trail and a variety of other activities. If you want to get some holiday shopping done early, check out the Arts & Craft Fair in Pewee Valley this month. November - Are you all festival'd out? Why not take a drive "down the hill" to Westport? This small, quiet town is on the Ohio River where families can enjoy fall colors, Westport Park and a little down time together. Knock on Wood Country Mercantile is a great place to visit for lunch or if it's a warm day, maybe a slice of some ice cream pie? December - Schedules are packed, everyone is tired. This month calls for some relaxing FREE entertainment. We love to drive through the Ballardsville Church Living Nativity. The kids love to see the animals and hear the Christmas story. Free hot chocolate and cookies wait for everyone at the end. Extend your night by driving around some of the neighborhoods nearby to look at Christmas lights. Here's what we found in 2018. If you want to get out of the house for an hour or so, the Oldham County Public Library has some great holiday programs this month. Sign up early for the Nutcracker performance and gingerbread house making. Their holiday open house is also a lot of fun. Other great and free holiday events are Yule Log in Pewee Valley and Light Up LaGrange.